Wolfstone Landscape Design is a superior landscape design professional. Lynn has an amazingly vast knowledge of flowers, shrubs, trees and grasses. She listened carefully to what style of landscape, color of flowering plants and layout that we were interested in. Then she prepared detailed alternative plans for us to review. She was very willing to accommodate our desires. Lynn coordinated and supervised the installation. She worked very well with the installer. She has done numerous follow-up visits. We now have a beautiful yard with something in bloom almost year round. It is gorgeous. 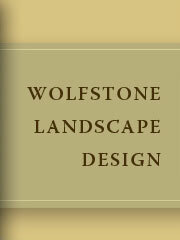 I have had the pleasure of working professionally with Wolfstone Landscape Design on several projects. When it was time to design the garden in my own front yard, We did not consider hiring anyone else. We wanted a garden with beautiful form and color year round that "fit" our 1920's shingled cottage. Of course, it had to be easy to maintain and not too thirsty. Lynn thoughtfully accommodated all of our priorities in a beautifully detailed plan. She is incredibly knowledgeable about plant material and has a special talent for putting together exquisite combinations that aren't expected. I highly recommend Lynn and her team. My company has worked with Lynn on several designs over the years and I have used Lynn to design my personal front garden. Lynn is extremely professional in her approach and careful to listen to the customers needs/wants. We work with several designers for our projects, but Lynn is always top of the list when she can work us into the schedule. My personal project with Lynn turned out great and she was able to assist with long distance procurement of plants when the local suppliers were unable to source. Fantastic service.